Fifth-grader Amira Gates of Asbury Park has captured the first honor on the road to being named a national Future Chef. “When I first went inside I felt nervous, but then I heard everything was going to be fine,” she said. Gates [at right] was one of 21 elementary students from the school district’s Barack Obama, Bradley and Thurgood Marshall to compete in Sodexo’s inaugural Future Chef’s Culinary Competition, said Asbury Park School District Communications Coordinator Chanta L. Jackson. Sodexo, the district’s dining company, is a partner in First Lady Michelle Obama’s ‘Let’s Move’ initiative to end childhood obesity. 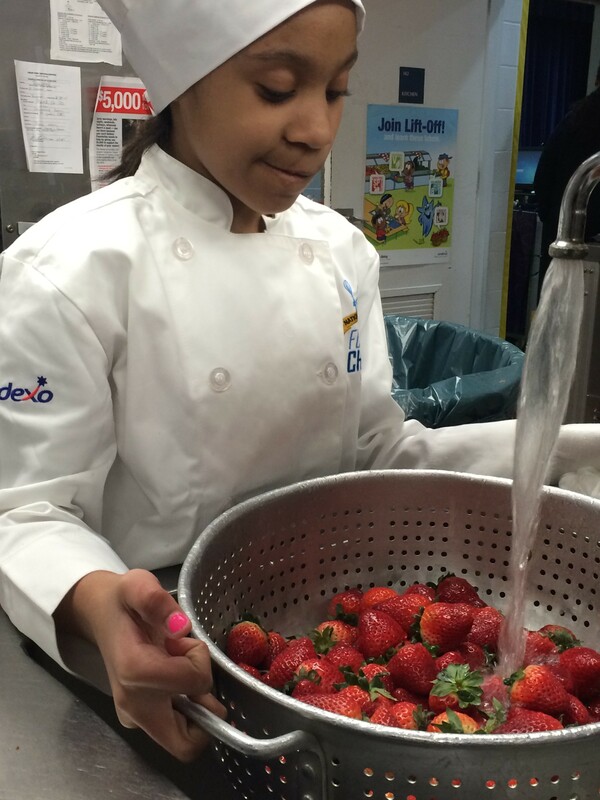 “The whole concept of this is to help educate the kids in healthy eating habits,” said Tyria Joyner, general manager for Sodexo in Asbury Park Schools. Students were asked to create a healthy, after-school snack recipe in their own handwriting, Jackson said. The top four finalist, [shown above] Daniel Delgado, Gates, Andrew Martinez and Briallan Mendoza, were all from Thurgood Marshall Elementary School on Monroe Avenue, Jackson said. The students’ recipes were judged on originality, taste, ease of presentation, kid-friendliness and use of healthy ingredients. The judges included Board of Education member Barbara Lesinski; school district Business Administrator Geof Hasting; assistant business administrator Ivy Brown; district employee Delmalis Roman and Thurgood Marshall Principal Mark Gerbino. It was Gates’ fruity tootie parfait that helped her claim the top prize. The recipe was one she created with her grandmother, who introduced her to the spearmint leaf that topped her recipe. The Asbury Park School District was one of approximately 230 others in 29 states to hold Future Chefs events throughout February and March, Jackson said. The winning student from each participating district will be considered for the regional finals. If selected, Gates will vie to become one of five national winners competing for the public’s vote on Future Chefs’ YouTube channel, Jackson said.